Today I wanted to ask you guys your thoughts on work/life and the balance between the two. Over the past few months, it seemed like Nick & I were going at 100 miles per hour. I'd get home from somewhere and then literally the next day or week, we'd be on our way to doing something else. It really hit us a month ago when we spent the whole weekend getting ready for a trade show in Las Vegas and I had to also get ready for a craft show the weekend after during the same time. We just worked through the entire weekend. That's when it hit us that we work a lot and forget to take time for ourselves. I had a little breakdown and just started to cry, feeling so overwhelmed with everything. and I thought to myself - at what point is it too much? At what point will I stop and recognize that quality over quantity is more important? I want quality of life. Instead of just working all the time, just to make a few extra bucks. Why don't I just step back and stop taking on the world. and my poor husband, he has a full time job on top of helping me so he pretty much has 2 jobs. So I was wondering your thoughts on this subject. Do you relate to any of this? Anyone out there a workaholic? Do you have a a hard time balancing work+quality of life? For the self-employed friends out there - do you make it a point to take a break? Or do you find yourselves working all hours of the day, every day? Even if you're not self-employed, I am sure you have other things in daily life that keep you busy. Is there anything specific that you do to be intentional about taking time for yourself? I just started being self-employed and I had a hard time managing my time. But since it was my husband and I's first year of marriage, we really wanted to make sure we spent a lot of quality time together, so I made a point to only work when he was working. Sometimes, it doesn't always work if I have appointments or whatever, but for the most part, I take a lunch break when he gets home for his (fortunately he can come home for lunch) and when he is off, so am I. Probably doesn't work for everything, but it has been amazing for us! Its tough and a problem many of us face with the internet, mobiles and 24/7 access. Its also hard when its your own business because when you're not working, you're not earning. However its important to take some time out otherwise you will burn out. I try to not go on the computer or ipad on a Sunday. Thats our family day where we do whatever and chill. Some people can work 12-14 hours a day and others much shorter. The boundaries of a 9-5 job are much more blurred so its important to create some for you when you can maybe take a Friday pm off, dont do email on a weekend, have one night off a week. Whatever works for you and yours. I can definitely relate to what you are saying. And somehow our families end up helping us with our businesses whether they want to or not. One thing I can recommend it to let someone else do the packaging for you. I used to employee a young teen to do that for me. She was paid by the piece. Some of the things I see you assembling can easily be done by someone else. You are costing your business a pretty penny to assemble and package your wares. Your time could be better spent doing other things. You hourly worth is more than minimum wage I am thinking. An intern is another great idea, that may or may not be possible...but worth considering. They work for the experience and not the $. Maybe you already know all of this. I hope you can find a way to work smarter and not harder. Prayers to you! 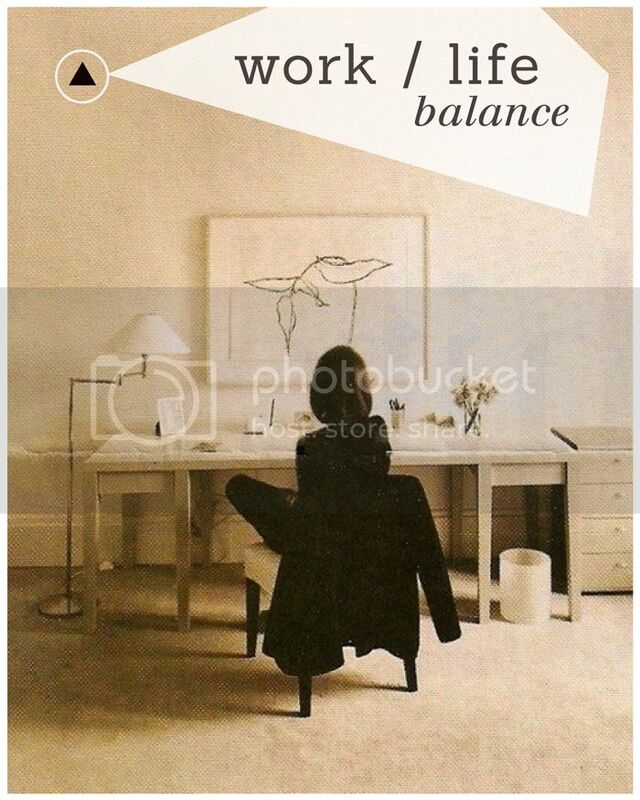 This post was a great reminder to me of my word of the year, Balance! I run my own baking business and after almost 5 years at it I'm finally learning some great lessons about this topic. First, I had to accept that my week is different than most peoples'. With most orders due on the traditional weekend, I'm swamped Thurs-Sunday, which makes my weekend Mondays and Tuesday. I've learned to take full advantage of those days that way it doesn't feel like every week melts into the next one. Time with my husband and son is incredibly important to me, as is taking care of the home we live in. I also have learned the importance of non-work time with my business partner, my Mom! We have to take the time together to connect with things we love outside of our business in order to keep our relationship strong. You're doing wonderfully in so many aspects of your life, and consider it a mark of brilliance that you're evaluating things now in an effort to make your future even more balanced and fantastic! I very much relate to where you are coming from. I currently work a full time job, as well as work with my partner at his business, which is only 1.5 years old. Eventually, the business will be able to support the both of us. I can't wait to fully jump on board! However until that happens, we are stuck working 65-80 hours a week, 7 days a week. It is exhausting! We try very hard to take time to ourselves and step away every now and then. (Easier said then done) The refresher helps keep us motivated. It's always important to remember that you are doing something you love, and not get burned out in the meantime. It's a constant struggle. I've slowed down this past year, taking less weddings & invitations, just so I could have more of a life. Despite my best efforts, I booked a wedding on my husband's birthday so I was working while we went to the beach alone. All I can do is try to give myself a break & do better in the future. Nonetheless, I use my down time at the agency to schedule and write my posts. This helps greatly because I'm able to continue maintaining my website and slowly grow my readers, while still keeping my current work hours. I'm not expecting to continue working full-time once I have kids, God-willing, in a couple of years... so, I will hopefully be able to manage my time once I'm at home. Hire an intern! Get someone to help you! Seriously- it will change your life for the better. Also, I am not a workaholic. My husband says I am, but I love my time off and will turn down jobs because I know it will be too overwhelming if I don't. I turned down four jobs in the last two months. I just discovered your blog today via Pinterest, and I am so, so glad I did. This post really hit home for me. I recently began my career in the magazine industry. Just months after scoring my dream job as an editor, my husband and I found out we were selected to adopt a sweet baby boy due at the end of July. We had just five weeks to fully prepare our house, our lives and our finances for him. When he was born, I felt like my life went from 150 miles per hour to about 2 miles per hour. Everything changed and I was forced to reevaluate my priorities and choose what I needed for my future and what was best for my baby. Long story short, I chose to make Jack my first priority and I changed my position at work so I could stay home with him as much as possible. It was, and still is, one of the toughest things I've done, and I still struggle with my life feeling completely turned upside down. Something that helped me was to reach out to my closest friends and ask them to call me & text me to remind me to meet them for a drink or dinner. Seeing friends is the best motivation for getting away from work. They literally pull me away from it. Another helpful tool for me is to set a timer. When the timer goes off, it's time to take a break to do something unrelated to work. I write my list of things to do when I get back, and take a break. And now I make sure that when my husband comes home from work, I make it a point to stop what I'm doing and visit him for a good quality amount of time. Hope this helps! Chin up! Since I turned 50 this past Jan.. I've really taken the time to evaluate my life and where it's going. Maybe that comes as you age, or maybe you can start thinking about these things anytime. For me.. I made conscious choices to say NO to things. To fiercely protect the quality of life my hubby and I wanted to live. It meant saying no to things. It meant saying thanks, but no thanks. Some ppl didn't understand. They thought i was foolish throwing away great marketing opportunities for my writing and my art. But honestly I made these choices for me. I can't do it all. I don't want to do it all. SO i started saying no.no. My life is now so much more stress free, no more self-induced stress and pressure any more in my life. Hubby and I are getting ready to move fr ND to FL in only a few weeks. We waited long and hard to be able to make these changes in our lives. I guard my time, our time now more than ever. It's what you make it to be. You can be busy, rushed, stressed, or you can live your days on earth peaceful and calm. I'm glad I left all of that rush and busyness behind. I don't miss it a bit. The money part of it? Sure we all could want/need more money.. but i've learned to live with less. and I'm blissfully happy. That's how I want to live. You know I am right there with you. I'm never not working. I'm hoping that lets up a little when I am finally full time. Also, I'm getting another assistant :) Yay! I'm learning to say No. It's tricky but I'm learning. I can totally relate! I work for myself and I am also a workaholic. I always feel like there is something that needs to be done and I have a hard time relaxing. It is frustrating to work and work and work and not often see the results you want. That is when I get frustrated. But, I believe that if I keep plugging away and producing quality work, it will just keep getting better and better :). Or busier and then maybe I can hire someone! Thank you for posting this! I completely understand the chaos that precedes a craft show, then the chaos after it, and trying to blog consistently... It's exhausting. I tend to go in spurts of crazy work (like 18 hours a day) and days of complete relaxation. Is this healthy? Probably not, but it works for me. I'm glad to hear I'm not alone in the weariness. Take a few days off, we will all understand!!! Thank you for this post! It's nice to know others battle with balancing work and family. For me, it's a daily struggle.I left a demanding, well-paying career in exchange to be able to stay home and be with my kids back in 2006. I started my business after the birth of my daughter and it quickly grew. Now, while I have flexibility, I work more than when I worked a 9-5. My days are crazy. I never seem to have a free day. Between shuffling kids to dance & football practices, volunteering in the class rooms,trying to maintain my household and run my home business I am stretched thin. NEVER enough hrs in the day.Never anytime for me.I too reached a breaking point recently.I had to cancel a planned family vacation because I had a huge order.I was behind, with a deadline approaching and still had several pieces to finish. I made the choice to cancel the vacation to stay home to ensure a happy customer. Frustrated, Stressed and Overworked I met my breaking point.I had to take a step back a re-evaluate what's important.My kids, My Husband, My Life. I realized it's not fair to sacrifice precious time with my family to make a few extra bucks.Looking ahead, it's our busy season.I chose to scale back Holiday Shows for the 1st time in many yrs to allow time to enjoy the with my family.Wishing you the best in finding the balance that works for you. Ahhh yes. I actually had a similar breakdown myself this week. When you're self employed, its hard to separate life from work since its always with you. I try to take a break for at least an hour a day when I'm feeling overwhelmed, but I still need to be better about sticking to a schedule and limiting distractions. I think its ok to "schedule" personal time too, but you just have to stick to it! I've come to doubt work/life balance - at least in the sense that I was raised to think about it. I've found that it helps to look at life in a broader scope to find your balance. Look at it season-to-season or year-to-year, rather than day-to-day balance. I've been able to find a daily work/life balance for maybe a week or two, and it all goes flying out the window again. Why? Because we never know what life has in store for us, at least, in the creative field. I think that is just the nature of owning your own business - there are highs and lows, busy seasons and slow times. If I wanted daily life balance, I would have gotten a 9-5 like my husband. I would say his life is pretty balanced - he goes to work, comes home, spends time with the kids, exercises, maybe does some yard work, and relaxes to play video games. That's what he chose. Me on the other hand - I chose an unpredictable, sleepless route. If I am going to find life balance, I have to look at it like a year-to-year balance, not a day-to-day balance. Some times of the year I have more freedom to do personal projects and travel, other times of the year, I am swamped and staying up until 3 AM. If things keep going the way they are going, busy season for me will become all year long. That is when decisions will have to be made - do I want the money and opportunity, or do I want the time with my family, or to read a book? Last March, I reached my "breaking point" - my husband is an accountant, so he works 70+ hours a week January - April, which means I am in charge of the kids and the house from morning to night... plus my blog was crazy-busy, plus I was guest posting, plus my shop got crazy-busy. Something had to go. I put my blog on hiatus, posting only twice a month or so; I stopped guest posting, and I stepped back from all social media. Life got so much better. I didn't feel like the undead anymore, and I had more patience with my kids. The best part? When I slowed things down a bit, I could see my work and life opportunities more clearly. Better opportunities came knocking on my door, and I could pick and choose which ones I wanted. I'm busier now than I was then, BUT I feel like I have more control over what I'm doing. Okay, I apologize, that turned into a blog post all of its own! I just really feel for you and know what you mean! Just know that it is okay to take a step back - making time for yourself can only improve your life. This has been on my mind lately, so I appreciate your thoughts and those of others who commented. A month ago, I began working part-time (30 hours a week, mostly from home) while still being a stay-at-home mom. I don't like to work when my son is awake, which means I end up doing a lot of my work during his (short) naps and after he goes down for bed. This means less time with my husband and less time doing anything for myself. Sometimes I feel like crying when I feel like my life isn't balanced, but then I remember what it was like to work full-time (and barely see my son) and also what it was like to be a stay-at-home mom without my job as my creative and social outlet. So this is the best of both worlds for me. I have to be careful to give my full attention to each thing when I put on that hat. So when my son is awake, I try not to look at the computer. And when he's sleeping, I focus on my work. One thing I've been sorely neglecting is time with God, so I recently started doing a Bible study with some women each Wednesday. Each week, it feels like a hassle to go (and is even more time-consuming to allot time for the study, which essentially is time in the Bible with God! ), but I KNOW it must be a priority, and I know I will benefit from that time. Otherwise, all the crazyness of life is all on my shoulders alone, and I know I can't handle the stress on my own. First of all, let me introduce myself -- I'm Jackie and I love your blog. I don't visit often, but it stays in my favorites bar (partially because I love that my fav bar says 'oh hello!' and partially because the creative juices flowing here and the ideas are just what I need sometimes! I recently left a 50+ hour job(not by choice) and ended up with a 37.5 hour workweek at a better job (and better pay!) it has allowed me to do so many more of the things I want to do with my life so I've jumped in! I starting doing photography on the side as a real job and absolutely love doing a shoot or two a month. I'm going back to school to get my MBA (because said new job will pay for part of it!) and I'm truly enjoying the work I'm doing in all aspects of my life -- I love working when I get to do good work at work and my photography and learning. This means it's hard for me to realize when I'm neglecting my boyfriend (of 3 years) and it's more important for me to keep my schedule straight now, because I need to make sure to see him. It's hard because he doesn't get as much joy out of his work, so while time with him is my resting time, it's when he wants to live and experience things and I don't always have the energy to plan those things. That's my current work/life struggle! Google calendars has helped to share our schedules, and trying to fit some 5ks and fun events into our hectic lives -- plus weekly meetings to make sure our non-work priorities are straight and we don't forget about the rest of life! My biggest priority I've been ignoring is trying to make my house more of a home. hard, when it's just a duplex and I have too much clutter! Thank you for writing about this, you're not the only one struggling with balance, thanks for the chance to vent. i can also relate to it because i've been there and my journey ended up in having a bad depression which i am now trying to escape of. i worked 10 hours at my office job and tried to build up a crafty business after that. the consequence was that i ended up stressing myself out too much and now i have no joy doing anything anymore. nothing! my passion for sewing and doing other crafty things has disappeared and i can't go to work since may. therefore i checked into a clinic where i receive help to get my mental health repaired. i hope this will help me after all and i can only recommend - for the sake of your health and personal life - to slow down now that you realized what's going on in your life. take your time to spend with your hubby, make room for yourself and breathe. this might sound silly but it's actually very simple and yet so challenging. just try. i don't want to see you drowning. I am definitely a workaholic. I always have been, and it takes SO MUCH to get me to relax and take a break. I just unplugged last weekend, and it was so great, but now this week I can't seem to get into that mindset again and it drives me nuts! The perfectionist in me usually holds the reigns. Even though we may not have all the answers, it helps to know that I am not alone, so thanks for writing this post. Also, I love that picture of Audrey painting. When I was writing in college, that was how I'd end up. On the floor, surrounded by inspiration, water (you gotta stay alive!) and my computer and notebooks. I just love that image. I so understand this. I would prefer a better work/life balance now that I have a wee one. It's hard to balance everything. I often find myself quit the work I do on the side, but I love it so much. I'm really beginning to realize how important it is to take time for myself and family.